Located in Putney SW11, the development comprises four apartments innovatively created with an ‘Air Rights’ planning permission. Situated on Upper Richmond Road in Putney, The View, which has been partly funded by our crowdfunding investment platform Propio.com, comprises high specification one and two bedroom apartments created on top of an existing block, building on our track record of converting airspace above existing premises into sought after new homes. The show home has been designed to appeal to young professionals looking for a stylish new home in this popular enclave of the capital. Situated just a short stroll from East Putney station and Putney Rail Station, the development is well-located with easy access into central London via the District line and National Rail, whilst also nearby is an abundance of green spaces including Putney Village and Richmond Park, as well as close proximity to the River Thames. A variety of popular restaurants are within easy reach of the property including the renowned Roxie steak restaurant and upmarket French brasserie, Gazette, on Upper Richmond Road itself. In addition, the area offers a wide selection of cafes, delis and coffee shops, as well as local nightlife, plus leisure and wellbeing facilities. Each home, built and specified to meticulous standards, boasts contemporary design and a high specification throughout, accommodating the highest standards of living. The View also boasts an exceptional outlook across London, taking in some of the capital’s most iconic buildings including The Shard, Battersea Power Station and Canary Wharf. 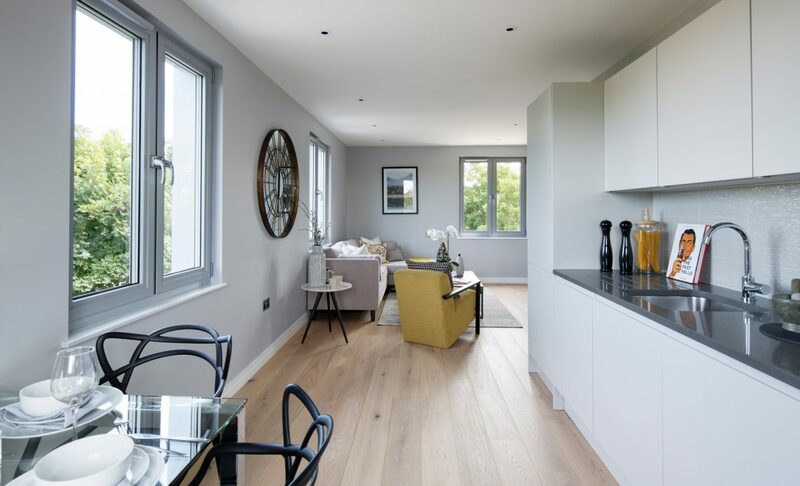 Accessed via a communal stairway, the one and two bedroom apartments enjoy bespoke kitchens with the latest Bosch integrated appliances, Silestone worktops and stylish square sinks with chrome mixer taps. Other key features include Engineered Oak flooring to all hallways and reception rooms, underfloor heating throughout, bespoke fitted wardrobes and stylish bathrooms with elegant chrome fittings, feature LED lighting to all bath panels and bespoke Walnut cabinetry providing the perfect space to unwind. There is also secure cycle storage available on-site. Available on London Help to Buy, prices start at £540,000 for a one bedroom apartment. Two beds are also available on Help to Buy priced at £600,000. Please visit the developments section of our website or call our sales team on 020 3828 0128.